James Mathieson born 10 December 1811 in Dalkeith, Midlothian. Helen Mathieson born 14 January 1816 in Dalkeith, Midlothian. Euphemia Mathieson born 15 April 1818 in Dalkeith, Midlothian. Violet Mathieson born 3 February 1820 in Dalkeith, Midlothian. John Mathieson born 13 February 1822 in Dalkeith, Midlothian. Jonathon Mathieson was born 2 December 1823 in Dalkeith, Midlothian. William Thomson Mathieson born 30 March 1826 in Dalkeith, Midlothian. James Mathieson born 10 Dec 1811 in Dalkeith, Midlothian. Helen Mathieson born 14 Jan 1816 in Dalkeith, Midlothian. Euphemia Mathieson born 15 Apr 1818 in Dalkeith, Midlothian. For the census of 1841 Euphemia was living in Sandy Dean, Lasswade parish, with some other "paper Makers" a few doors down from her father's household. For the census of 1851 Euphemia was living with her little brother and his family in Bonnyrigg, Cockpen parish. For the census of 1861 Euphemia was working in a mill, still living with her brother in Bonnyrigg, Cockpen parish. On 10 Jul 1863, in Liberton, Euphemia married Peter Inglis, a labourer, son of David Inglis, a school master, and Helen Brunton . Peter was born on 27 May 1827 in Manor, Peebles. Euphemia died on 21 Apr 1870 in Moorfield Cottage, Dalkeith, Midlothian. As far as can be established there were no children. Violet Mathieson born 3 Feb 1820 in Dalkeith, Midlothian. For the census of 1841 Violet was living in Sandy Dean, Lasswade parish, . She like her sister Euphemia was working as a Paper Maker, and again living a dozen or so doors down from her father in the Stenhouse "household"
Violet married William McCaskie, a brick maker, 20 November 1845, Dudingston, Edinburgh. William was born about 1813 in Dudingston\Portobello, Edinburgh. For the census of 1861 Violet and her husband were living at Whinnirow, Sandydean, Lasswade. For the census of 1881 Violet and William were living in Redrow, Bonnyrigg. For the census of 1881 Violet and William were back in Lasswade at Eldindean. For the census of 1891 Violet and William were back in Violet's home town of Dalkeith. Violet died on 5 May 1891 in Union Poorhouse, Dalkeith. I believe that William died two years later in 1893 in Dalkeith, Midlaothian. As far as can be established there were no children. John Mathieson born 13 Feb 1822 in Dalkeith, Midlothian. Baptised 16 Mar 1822. Suspect may have died in infancy as next child was baptised Jonathon. Jonathon Mathieson was born on 2 Dec 1823 in Dalkeith, Midlothian. Mary Gunn was born about 1871 in Edinburgh. She married Ernest Eld in 1896 in Newtown, NSW, Australia and they had at least 2 children. Mary died on 8 July 1938 in St Peters, NSW, Australia. Christina Gunn was born in 1873 in Leith, Midlothian. Went to Australia with her parents. Nothing more currently known. James Gunn was born in 1877 in Lancashire. Went to Australia with his parents. Nothing more currently known. George Gunn was born in 1878 and died in 1879 during the voyage to Australia. There is a Thomas Matheson Gunn born in Glebe, New South Wales, Australia in 1880 whose parents were James and Mary. I would assume this was a further child of James Gunn and Mary Matheson. There is a death of a Thomas M. Gunn, son of James and Mary recorded in Paddington in the same year, who I would assume is the same Thomas dying as an infant. Mary born about 1875. Mary married William Wilson on 24 June 1898 at: Armadale, West Lothian. William was born on: 22 April 1871 at: Bathgate, West Lothian, son of William Wilson and Helen Gillespie. James born about 1879. James married Elizabeth Downie, daughter of James Downie, a carrier, and Elizabeth Campbell in 1900 in Musselburgh. The 1901 census shows James, Elizabeth and a two year old daughter, Elizabeth in the household of his mother-in-law Elizabeth Downie (689/00 009/00 040). For the 1881 census (689/00 07/00 012) James, a pattern maker, and Agnes were living with their children at 31 High Street, Fisherrow, Inveresk. For the 1891 census (689/00 07/00 027) James, a wood pattern maker, and Agnes were living with their children at High Street, Fisherrow, Inveresk. I believe that Agnes died in 1893, aged 44, followed the following year by James, aged 45, but sight of the certificates has not been had. George born about 1854 in Cockpen parish (probably Bonnyrigg). Does not appear in the 1861 census, but appears in the 1871 census? Went to Australia in 1879 on the Nineveh with his parents recorded as a Mason. George died on 8 Jan 1913 in Petersham, New South Wales. Australia. Nothing more currently known. Catherine born 10 May 1856 in Redrow, Cockpen parish. Went to Australia in 1879 on the Nineveh with her parents recorded as a Female Servant. Catherine married George Potter on 15 May 1885 in Petersham, NSW, Australia, and they had at least 4 children. Catherine died in 1946 in Woollahra, New South Wales. Australia. Margaret born 7 December 1859 in Cockpen parish (probably Bonnyrigg). Went to Australia in 1879 on the Nineveh with her parents recorded as a Female Servant. Margaret married James Gray on 28 April 1883 in Lasswade, Marrickville, New South Wales. Australia. Nothing more currently known. Alexander born 12 March 1862 in Cockpen parish (probably Bonnyrigg). Went to Australia in 1879 on the Nineveh with his parents recorded as a Mason. Alexander died in 1926 in Chatswood, New South Wales. Australia. Nothing more currently known. John born 7 September 1868 in Cockpen parish (probably Bonnyrigg). Died 18 February 1869 in Bonnyrigg, Cockpen parish. John was with his father and step-mother for 1841 census. For the census of 1851 he and his family were living in Bonnyrigg, Cockpen parish. John's elder sister Euphemia was also in the household. For the census of 1861 John and family were living in Salters Road, Bonnyrigg, Cockpen parish, with Euphemia still living with them. Their eldest daughter Mary was working as a Domestic servant a few doors away, in the house of Thomas Patterson, an architect and surveyor. For the census of 1871 John and family were still in Bonnyrigg in Union Street. The son listed as George, a mason, does not appear in the previous census but is the same age as Thomas who does appear in the two previous censuses but not this one! Probably one and the same individual, possibly called Thomas George Mathieson. On 10 April 1879 John and Mary along with five of their children set sail from Plymouth along with 398 like minded souls on board the 1174 ton wooden sailing ship the Nineveh, heading for a new life in Australia. Like their father George aged 24, Alexander aged 17, and William aged 14, were all recorded as "masons", with the two daughter Catherine aged 22, and Margaret aged 19, recorded as "female servants". Also on board was their daughter Mary and her husband James Gunn, a joiner, along with eir children, Mary aged 7, Christina aged 6, James aged 2 (born in Lancashire). A fourth child an infant, George B was recorded as having died on the voyage. Whether he was born prior to their departure or during the voyage is unknown. 90 days later on 9 July 1879 in Sydney the ship and her passengers arrived in Sydney. A further 5 children died during the voyage, 4 between the ages of 1 and 12, and 2 infants in the first year of their lives. However there were also 4 babies born during the voyage who survived. It is difficult to imagine what life must have been like for the 450 odd souls, passengers and crew on such a voyage in the relatively confined space of the Nineveh. For the voyage of 1879 the Nineveh was captained by her master John Ross, with a crew of 41. 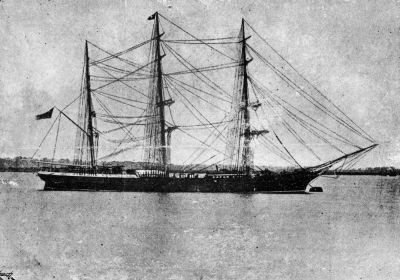 The Nineveh was built in 1864 by Walter Hood, Aberdeen for the Aberdeen White Star Line. She was 209.9 feet long, with a 36.3 foot beam and a 22.6 foot draught. The Poop deck was 61 feet long with a 42 feet long Forecastle. This company was renowned for the smartness of their ships, with their green painted hulls, white masts and spars and gilt scroll work at their bows and sterns. The "Ninevah" was considered a lucky ship with her freights and passengers and made a great deal of money for her owners. Her Last Voyage -The Nineveh left Moodyville, British Columbia, on or about the 15th day of January 1896, bound for Sydney, Australia, with a cargo of lumber, 300 tons of ballast and a crew of 18 hands. The following day having encountered bad weather she put into Port Angeles, State of Washington. She eventually put back out to sea on 24th January but soon encountered further bad weather and by 25th she was caught in the teeth of a full hurricane. by the 26th she had suffered severe damage and the pumps were fighting a losing battle. A course was set for the nearest port but on the morning of 27th January a passing schooner, Compeer, was sighted and with opportunity of being taken off the stricken vessel the Captain had to concede defeat. He and his crew transferred to the Compeer leaving the Nineveh to her sad fate. The families seem to have settled in and around Sydney New South Wales. 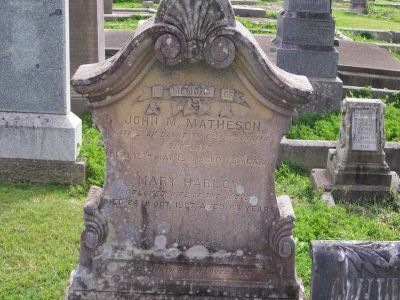 John Matheson passed away on 12 May 1901 and was interred in Grafton Cemetery. The death index records his father's name as James and his mother's name as Margaret. His wife Mary Harlow lived on for a further six years passing away on 24 October 1907 and was laid to rest alongside her husband in Grafton cemetery. The death index records her father's name as John but gives no mother's name. William Thomson Mathieson born 30 Mar 1826 in Dalkeith, Midlothian. Baptised 23 Apr 1826. William was with his father and step-mother for 1841 census. There is a William Mathieson, aged 24, born in Dalkeith, County of Edinburgh, recorded in the 1851 census for the Isle of Man. He was recorded in the Castletown Barracks, a Private Soldier, previously a Farm Servant. The regiment is not identified but fortuitously there is a Lieutenant Joseph Owgan recorded with the men and there is an entry in the London Gazette of 1845 "91st Foot - Ensign Joseph Owgan to be Lieutenant by purchase, vice McInroy who retires. Dated 21st March 1845". This would suggest that this contingent of men are from the 91st (Princess Louise's Argyllshire Highlanders) Regiment of Foot latterly the Argyll and Sutherland) Highlanders, and as this was the regiment his elder brother had enlisted in this would seem to be a reasonable assumption. The is also a record of a Private William Mathieson No. 2648 of the 91st perishing on the wreck of the troopship HMS Birkenhead which was wrecked on 26 February 1852, while transporting troops to Algoa Bay at Danger Point near Gansbaai, 87 miles (140 kilometres) from Cape Town, South Africa. There were not enough serviceable lifeboats for all the passengers, and the soldiers mustered on deck and stood in an orderly fashioning allowed the women and children to board the boats safely and escape the sinking. Only 193 of the estimated 643 people on board survived, and the soldiers' chivalry gave rise to the unofficial "women and children first" protocol when abandoning ship, while the "Birkenhead drill" of Rudyard Kipling's poem came to describe courage in face of hopeless circumstances. A number of Naval personnel were court martialled as a result of the accident but, as none of the senior naval officers of the Birkenhead survived, no-one was found to be to blameworthy. Captain Edward W. C. Wright of the 91st Argyllshire Regiment told the court martial - "The order and regularity that prevailed on board, from the moment the ship struck till she totally disappeared, far exceeded anything that I had thought could be effected by the best discipline; and it is the more to be wondered at seeing that most of the soldiers were but a short time in the service. Everyone did as he was directed and there was not a murmur or cry amongst them until the ship made her final plunge – all received their orders and carried them out as if they were embarking instead of going to the bottom – I never saw any embarkation conducted with so little noise or confusion." Does this explain "our" Williams sad fate? It may be possible to prove whether or not the William Mathieson of 1851 was the same William Mathieson who went done with the Birkenhead if the Muster Roll for the Isle of Man garrison on 1851 was checked. This should include William Mathieson along with his regimental number so ascertain whether that is 2648. Should anybody reading this be able to assist in confirming or disproving any of the above, supply other details, or simply wish to "discuss" please use the Contact Form at the top ot the page. There was a William Mathieson who married a Margaret Coutts in Penicuik on 14 February 1851 and initially I suspected that this was "my" William. However subsequent investigation has proven that it was not. This William was the son of Thomas Mathison, a labourer, and Margaret Brownlee. In the course of this research I have accumulated some information about this family and William and Margaret who moved to Northumberland just prior to the 1861 census. Should this family be of interest please get in contact using the Contact Form at the top ot the page as I would be more than happy to share what I know. !